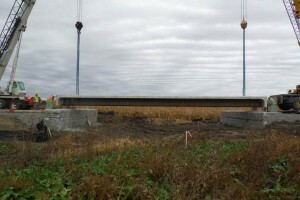 by Khalil Jaber P.E., Deputy Director for Engineering, Nebraska Department of Roads; Fouad Jaber P.E., Assistant State Bridge Engineer, Nebraska Department of Roads; Matt Macey P.E., Vice President & Chief Structural Engineer, CDR Bridge Systems. 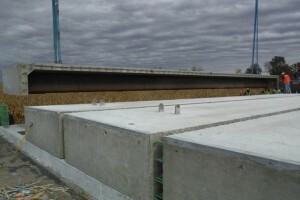 Description: In 2014 a rural roadway in Boone County, Nebraska was closed 30 working days to construct the Primrose East Bridge, a Geosynthetic Reinforced Soil-Integrated Bridge System (GRS-IBS). The GRS abutments were built in 15 days including abutment excavation, to support the 58-ft-long single-span modular decked beam superstructure. The four pre-topped folded steel plate girders were erected in just two hours. 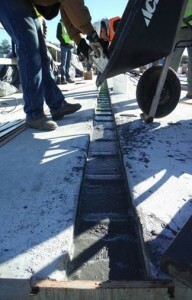 Closure joints of ultra-high performance concrete (UHPC) completed the deck construction. This presentation described design and construction of the bridge and lessons learned.